Ireland’s longest-serving TV weather presenter Evelyn Cusack will no longer appear on our TV screens after being promoted to a top job in Met Éireann. 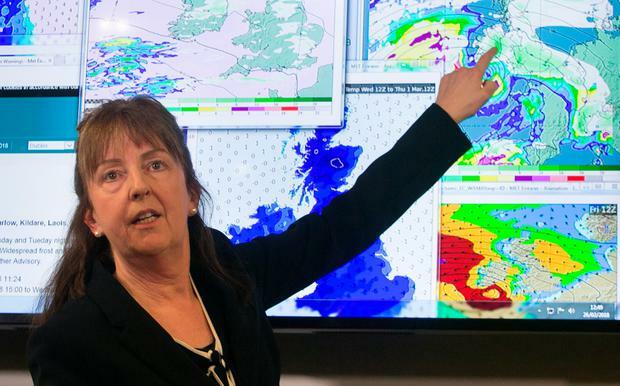 It was announced to staff in the meteorological service yesterday that Ms Cusack is to become Head of Forecasting, a role left vacant by the retirement of another viewer favourite, Gerald Flemming, in December last year. The announcement, confirmed to Independent.ie by Met Eireann, will see an end to Ms Cusack's nightly appearance on RTE. A source from the forecaster said: "It was only announced in the last day or two. "The interview for the role was last week and there was an official email recently sent out stating the decision made. "She will still be on TV at times during important weather announcements and such, but definitely not as much." Meanwhile, a spokesman for the Department of Housing, Planning and Local Government, said that whilst no official announcement has been made, meteorologist Cusack is expected to take up the role in the coming weeks. Evelyn is Ireland’s longest serving TV weather presenter and has been on our screens for 30 years. She first appeared as part of the launch of RTÉ’s Six One News in October 1988. Most recently she was part of the National Emergency Co-Ordination Group which kept the public informed about the so-called 'Beast from the East' and Storm Emma. Her popularity among viewers also saw her crowned Ireland’s Favourite Weather Forecaster at the TV Now Awards in 2009, the first time an RTÉ weather presenter won the award. She has also taken part in a number of reality TV shows over the years including RTÉ’s Failte Towers in 2008 and Celebrity Masterchef on TV3 in 2017.